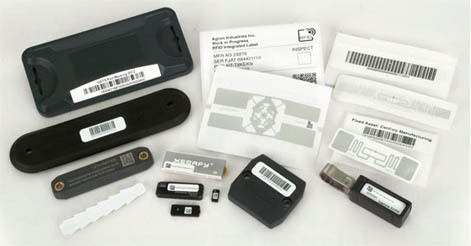 Barcodefactory offers encoding and printing of RFID hard tags and printing and encoding on RFID labels. We can encode any RFID tag and offer labeling services including the addition of a common value barcode on RFID tags. For pricing, please fill out the form and tells us about your project. Please advise quantity and tag or label specifications required or just ask us to contact you. We will provide pricing within 1 business day. RFID tags typically come with a 24 character Hexidecimal tag value, but not in your desired format. Because RFID tags are used to identify specific assets, most RFID tags need to be encoded with data before they can be used. - Encoding RFID Tags with your preferred data. What data will be encoded to my RFID Tags? If you purchase custom printing and encoding, Barcodefactory will encode 24 digits of hexadecimal characters to the RFID tag's EPC memory. The Sequence can be sequential or we can add values like letters to help identify assets or areas that are specific to your operation. Contact us to discuss your requirements. Can I have human readable data printed on the tags? In addition to the 24 character number printed as human readable, we can add text to help identify the asset name, class, business or any other requirement. All RFID tags and labels are checked and read to ensure accuracy. If you need no missing numbers, please advise our team member and we will ensure all your requirements will be met. Barcodefactory, a Paragon Print Systems, Inc. company is committed to simplifying the integration and use of RFID and Barcoding technology. We offer site analysis, tag testing, professional integration, consulting and installation. We are premier partners with the world's largest RFID and Barcoding equipment, Label and tag manufacturers. This provides our clients with the very best pricing in RFID hardware and supplies. We can manage the entire process from concept to installation. Since 1994, Paragon has offered clients worldwide with cutting edge technology designed to improved productivity and reduce operational cost. CONTACT US to discuss your RFID application.